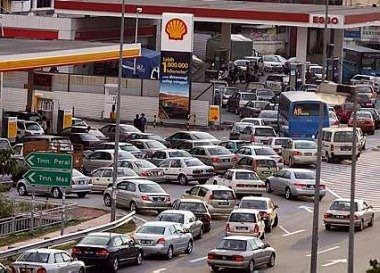 The government of Malaysia has announced that the government will no longer subsidise petrol and diesel to the country. This will eventually lead the price of petrol to increase. 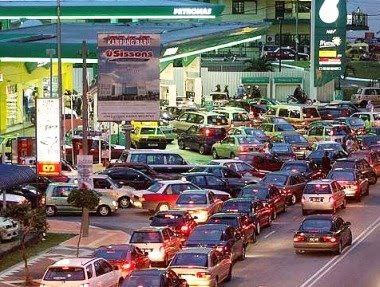 First time in history, price of petrol has increased RM0.78 per litter which is from RM1.92(West Malaysia)/RM1.91(East Malaysia) to RM2.70 whereas price of diesel has increased RM1.00 per litter. This is way to insane! These are the scenes that happened yesterday every corner in Malaysia, especially in the city. I'm also one of the victims which has trapped in the traffic conjunction for 2 HOURS! What I saw yesterday in Miri is worse than pictures below, what about Kuala Lumpur? Think twice before you wanna start your car's engine because the prices are almost doubled the previous prices. Based from the news recently, the amount of fuel will extinct at the year of 2013. Anyhow, just don't worry, there are plenty of reserved ground fuels around the globe. Pictures were taken from The Star newspaper. so its that bad in Miri too? It's great that I caught you here. Indeed, it was the worst traffic that I ever faced before(I drive). Well, I live in KL but I never stuck for 2 hours before. I was heading towards town from Permyjaya. There is a new Shell station there(opposite the current one). Whole Miri was packed with cars. One lane can divided into 3 lanes, cool heh. I had to sacrifice that 2 hours and neglect away my Chemistry project, lol. Get anything you want from here, hehe. Come again.